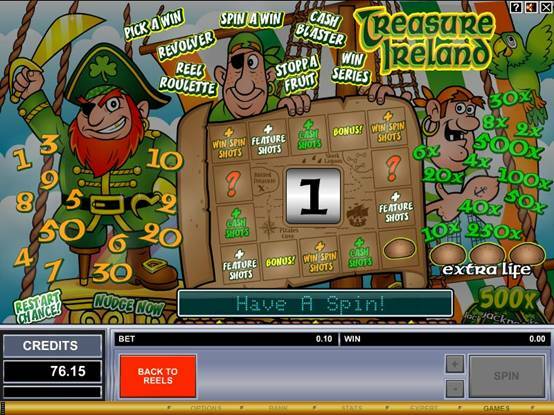 Treasure Ireland is a traditional AWP machine with nudge and hold functionality. It has a typical lapper style feature board with Feature and Nudge stacks and a cash pot. Using a 3 reel, one pay-line platform, Treasure Ireland is an AWP machine with the traditional nudge and hold features that enable you to give Lady Luck an extra push to deliver on a whole range of opportunities and rewards. It has a typical lapper style feature board built around a treasure map with Feature and Nudge stacks and a cash pot. 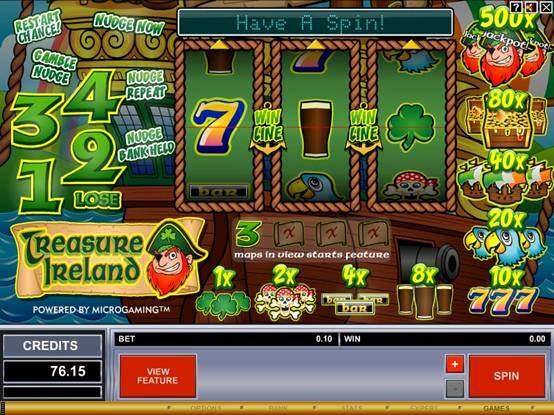 Using brilliant graphics and sound effects, the new game faithfully captures the UK 'pub' feel of these entertaining fruit machines with added appeal through a more complex playing experience in a truly dynamic game. The genre has more player involvement and offers you better chances to win by using player interaction and skill elements. This 3 reel machine has a “3 in view” feature with the reel bands overlaid with game symbols. When all 3 reels carry the same symbol within the reel window, the feature launches. This is made up of a 14 position lapper board and 3 shot pots for features, cash and win spins. The goal is to move around the lapper and its many opportunities and a few obstacles by rolling a 4th reel that has numbers from 1 to 12. There are win spin shots, feature shots and “cash shots squares” that award the player a number of shots within the respective shot pot. There are also a number of bonus squares which award special bonus prizes. 5000.00 payout, or at least his famous loot-filled treasure chest for a 80x, but there are plenty of other winning chances before that in a game full of options and opportunities to combine both skill and luck. Adding to the fun and suspense are Extra Life Awards which can give you an extra chance to stay in the game, a boost around the board or a restart chance to trigger the feature again once it has completed its cycle.